Florence Eggleston b. 1864 Glebe, N.S.W. 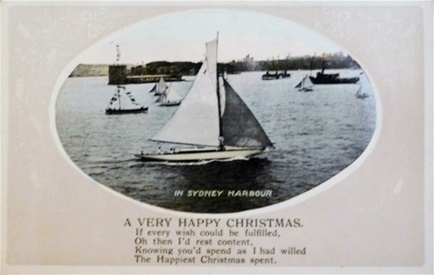 – d. 1926 Sydney, N.S.W. William T. Eggleston b. 1866 Newcastle, N.S.W. – d. 1924 Paddington, N.S.W. James B. Eggleston b. 1868 Newcastle, N.S.W – d. 27/7/1871 Market Wharf, Newcastle, N.S.W. Ernest Albert Eggleston b. 1871 Newcastle, N.S.W. – d. 1939 Newcastle, N.S.W. Emily Annie Eggleston b. 1873 Newcastle, N.S.W. – d. 1913 Granville, N.S.W. Maud M. Eggleston b. 1876 Newcastle, N.S.W. – d. 1919 Waverley, N.S.W. Thomas Singleton E. Eggleston b. 1878 Newcastle, N.S.W. - d. 1945 Guyra, N.S.W. Charles G. Eggleston b. 1881 Newcastle, N.S.W. 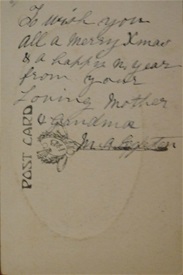 – d. 1910 Newtown, N.S.W. Blanche B Eggleston b. 1884 Newcastle, N.S.W. Alice M. Eggleston b. 1886 Newcastle, N.S.W. In 1865 Thomas Eggleston was operating as a Nurseryman at Lake Macquarie Road, Newcastle. The following newspaper advertisement appeared in the Newcastle Chronicle and Hunter District News on 24th May, 1865. 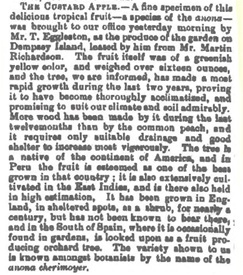 Thomas Eggleston, Nurseryman, Seedsman, and Florist. All kinds of vegetable, farm seeds, flowering plants, trees, shrubs and fruit trees, a great variety, wholesale and retail. Agent for Horticultural Society's Magazine and Gardening Information. All orders entrusted to Mrs WELHAM, Hunter-street will be punctually attended to, or to the Nursery, Lake Macquarie Road, Newcastle. Gardens Laid Out, Planted, and Kept in Order, by Contract or otherwise. The following information has been kindly supplied by Jason Smith - a descendant of Mary Ann Welham. The young family must have experienced some difficult times financially. The NSW State Archives lists Thomas Eggleston in the Insolvency Index. The record states that he became insolvent in 1867 and at the time had been working as a Dealer in Singleton, NSW. At this time they had three children under six years of age. The NSW State Archives also tell us that Thomas and Mary Ann's sons, Thomas Singleton Eggleston and Ernest Albert Eggleston established a business on the 17 th July 1903. 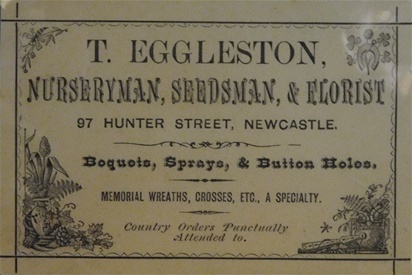 The business traded under the registered name of E T Eggleston and it was a “seedsman and florist “ business located at 85 Hunter Street, Newcastle, NSW. Information kindly supplied by Lee Eggleston - a descendant of Mary Ann Welham. As reported in the Newcastle Chronicle - Thursday 22nd June, 1871. To wish you all a Merry Xmas & a happy new year from your Loving Mother & Grandma. M.A. Eggleston. Maitland Daily Mercury Newspaper 14th July, 1915. FLORENCE EGGLESTON b. 1864 Glebe, NSW, d. 1926 Sydney NSW. was the eldest child of Mary Ann and Thomas Eggleston. She married William Henry Sudbury in Newcastle in 1892. William had come to Australia aged 23 on the Lusitania arriving in Melbourne in 1883. They had 3 children: Cecil who was born and died as an infant in Newcastle, Henry Compton and Dorothy Florence Vera. WILLIAM T EGGLESTON (born 1866 Newcastle, NSW - died 2 Aug.1924, Paddington, NSW) was the son of Thomas and Mary Eggleston (Mary Ann Orphan Welham). He married Eliza Crane (born 1865 Maitland, NSW - died 1946 Parramatta, NSW) in Newcastle during 1895. They had one known child, Doris Lillian Eggleston, who was born in Newcastle in 1895. James B. Eggleston, a boy about four years old, was the victim of a terrible accident at Dempsey Island, near Newcastle, on the 22nd ultimo, and died on the 25th. The tale is told in the evidence of the mother, who is the wife of a farmer. She says, on Saturday morning, the 22nd July, about half past 7 o'clock, I left the deceased playing with his brother and sister on the bed, in the bedroom; while I went to the kitchen to get some water to give the children a bath, and from there to the yard to bring in some wood to put on the fire, and whilst I was picking up the wood, I heard a scream, and immediately ran into the house, when I met the deceased at the door with his night gown and little shirt which he had on in flames; I wrapped him in my dress and extinguished the fire; I applied some oil and flour on the injured parts, assisted by my mother; he appeared to progress favourably until Tuesday, at 1 o'clock, when I noticed that a change had taken place, as he seemed much weaker; his father at once sent for Dr. Harris, who returned in the boat with the messenger; deceased expired about ten minutes to 6 o'clock, shortly after the arrival of the doctor; the fire is in the sitting-room, which is the next one to where I left the children; there was only a small fire which had just been lighted; I could not have been absent more than ten minutes. Dr Harris found the boy suffering from a severe burn on the neck and over the stomach, and had only time to dress part of the wound when the child was seized with convulsions and died within twenty minutes. 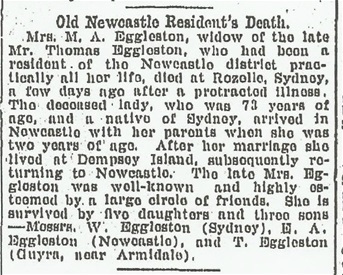 EMILY ANNIE EGGLESTON'S marriage notice as recorded in the Newcastle Morning Herald & Miners' Advocate 30th October, 1897. Emily was the 5th child of Thomas and Mary Anne Eggleston (nee Welham). Armidale Express and New England General Advertiser - Tuesday 8th March, 1921. Mr T.S. Eggleston, Guyra, has been informed that he has been appointed by the Minister for Labour and Industry as a sub-agent of the Labour Exchange. He will arrange to meet the needs of employers and employees communicated to him. It is proposed by the Minister to establish sub-agencies in every important town in the State, in order that a net-work of sub-agencies may be established. Emily Annie Brewer, formerly Eggleston. The marriage took place in October, 1897, at Newcastle, according to the rites of the Australian Independent Presbyterian Church. His Honor: Did she say why? – She said I treated her like a dog, that I ill used and abused her, that I starved her, and that I was a drunkard and addicted to morphia. Mr Flynn: Did you ever take morphia? – Never. Did you ever hear her say “On the morning of the sale we had breakfast together at his parents’ place?” – Yes. Was there an order made against you at the police court? – Yes. For how much? – Pd 1-0-0d a week. What became of that order? – It was set aside by the Full Court. A decree was granted as asked. (Newcastle Morning Herald & Miners’ Advocate – 18th June, 1907). As there is a 'Mary Orpen' (b.30 Aug 177 in the family tree, should it be 'Mary Ann Orpen' rather than 'Orphan''? Possibly transcribed incorrectly? Please contact me on richobj@bigpond.net.au and I may be able to help you. Hi, I'm researching some aspects of policing in Sydney during the 1930's and was hoping to speak with any living relatives of Constable John George Earl Roach.